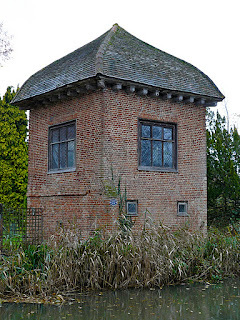 If ever an architectural feature expressed an aspect of Englishness and eccentricity, the English "folly" does. Usually sited in gardens, the english folly is a flight of the imagination that draws on history, myth, illusion, and plain inventiveness just for the fun of it. Often the building is a "mock" castle, such as the one above, or other romantic ideal. However, a folly need not necessarily be in a garden. 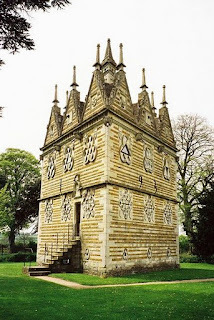 One of the earliest eccentric follies was Sir Thomas Tresham's Rushton Lodge built between 1595 and 1597. (Below left) The Lodge, a strange triangular confection, was an exercise in expressing Tresham's views on the secret symbolism of numbers, and the Trinity. It carried its three-fold symbolism to extremes with three sides to the lodge, three floors, three trefoil windows on each floor, and even three smoke-holes in the chimney! Also carved all over the building are Tresham’s initials; the many clover leaves found on shields and on top of the obelisks are part of his family crest. Many dates can be found on the building too: 1580, for example, is thought to be the date of Tresham’s conversion to Catholicism. Other aspects of the design are a bit wackier - why are there birds and kings’ heads hiding in the gables? The most common form of folly was without a doubt, the tower. Above you can see Wimpole Folly - fake ruins combined with a tower, all built in the 18th century to look exactly like a Saxon ruin! 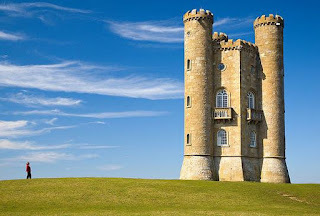 Visitors to England could well be confused as to what are genuine ruins and what are flights of a rich landowners fancy. This seventeenth and eighteenth century craze for fantastical buildings has given the English their love of summerhouses or garden retreats. Here is an early example, where the poet John Donne supposedly lived with his young wife. My local town of Kendal has 17th century houses with stone summer houses still existing in the gardens. They were used then mostly by men for smoking, snuff taking, and for the taking of tea, coffee and chocolate - then very expensive habits. Some summer houses were octagonal in shape, some square, like John Donne's brick built one which has a lovely riverside site. You can find out more about this particular summerhouse and other historic places of interest on the lovely walks website at www.walkinginthecountry.blogspot.com. When I was researching The Lady's Slipper I used this idea of the summerhouse in the garden to make a studio for my character Alice Ibbetson to paint her watercolours and botanical studies. 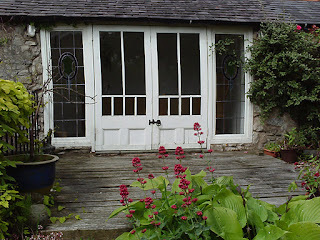 And below you can see my very own summerhouse in the bottom of my garden - still used by me for drinking tea today! And no I don't know why the picture is all a bit wavy as if my camera went through a mangle, must be all that tea. 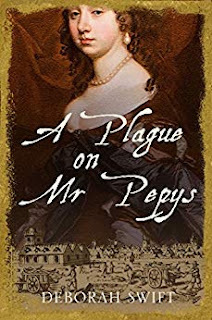 An Editor's Choice from the EHFA Archives, originally published November 2, 2011. I liked learning about the various follies. Sir Thomas' folly was a bit creepy in a way. Lovely post, Deborah. The English certainly have had some creative ideas of what to put in a garden. i'm reminded of the lordly garden owner who advertised for a hermit. The requirements -- don't cut your beard, appear now and then and speak to no one, and of course, live alone. I believe I have this from Dame Edith Sitwell's wonderful book on English Eccentrics. I do so love a jolly folly! Some of the finest-- present-day--must be in Prince Charles' gardens at Highgrove. If any of you are wanting a lady to accompany them to the 'Black-tie' event in the Orchard Room--I'll be haunting at the Ruins! How many of us can accompany you, Lady A~? If it is first come first served, here I am. I love this post, Deborah! I had no idea of this folly- or these follies. I can see why people would build them, provided they had the space and resources. A bit of a castle, for castle lovers. I would want a summerhome like I saw in a movie- no walls, just a beautiful roof held up by majestic pillars. I have inserted one in my next book, since I can make up anything I want. Follies have always fascinated me. Great post! And there's T.H. White's "Mistress Masham's Repose" -- about a folly with resident Lilliputians escaped from Gulliver. WoW. 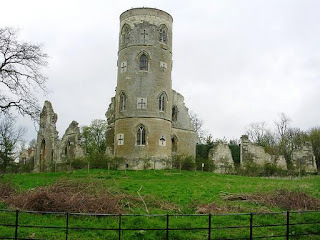 Thanks to Deborah Swift, author of the Lady's Slipper for this fanciful article on the English Folly: Flights of Fancy Set in Stone. Can I come drink tea in your delightful summerhouse? Hello everyone, and thanks for your comments. I would love to welcome you to my summerhouse for tea. Will you bring the scones? Katherine, I had forgotten about Mistress Masham's Repose! I could do a whole series of posts on Follies as each one has its own story, and the people who built them were not afraid to put their wild ideas into practice. I love the "hermit requirements" too!